Good morning (or afternoon) everyone! I so hope you enjoyed everyone's projects from day one of the hop! I hope you continue to hop along with my Design Team sisters and I, as we continue with the second day of fabulous projects. I have created two cards, and one home decor piece for you today. The main cartridges I used are Plantin Schoolbook, Spring Holiday Cards, and Cricut Cakes Birthday Cakes. My post is a bit picture heavy, but I wanted to make sure I showed you everything. First up is a cute gender neutral birthday card. The card base is a standard A2 size - Cut at 4.25 by 11; scored and folded at 5.5, to form a 4.25 by 5.5 inch card base. The red mat is 4 by 5.5, and the polka dot mat is 3.75 by 5. I inked around the edges using Memento rich cocoa ink. 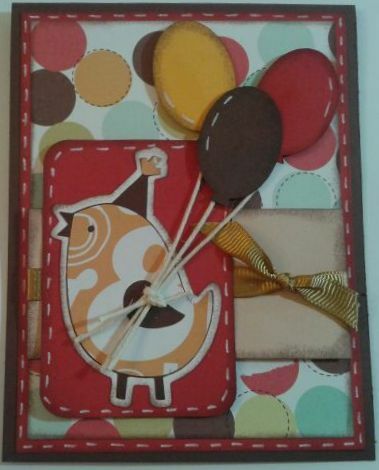 The papers I used for this card are from the Imaginisce Birthday Bash paper pad. For this card, I used the Cricut Cakes Birthday Cakes cartridge. 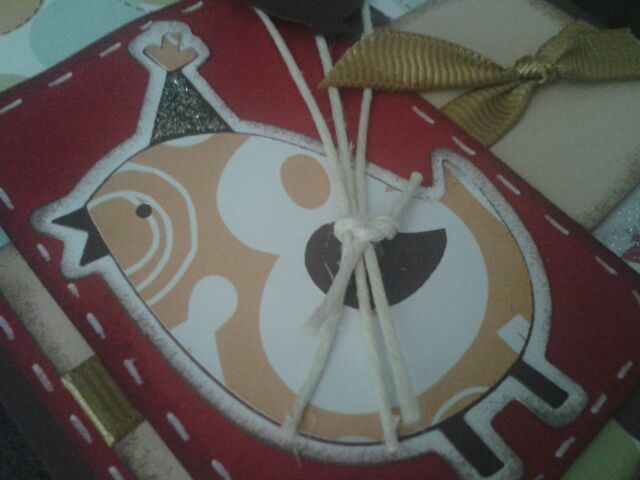 I cut the shadow for the bird at 3 inches, the bird at 2.9, and it's layers at 2 inches. I adhered everything together, and then matted him on a piece of red card stock that was just a little larger. I then used a white gel pen for faux stitching on this piece. 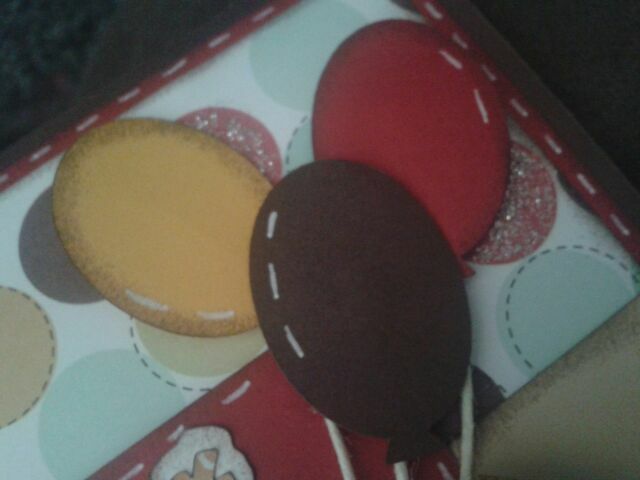 Next, I moved on to the balloons which I cut three of at 2.944 inches. I cut the tails off, because I knew I wanted to use my own jute instead of a paper tail. I then added some silver glitter to the red polka dots in the background paper for some added interest. This card comes together quickly, but is super cute and definitely something you could mass produce. For my next project, I used Spring Holiday Cards, and Plantin Schoolbook. This is a cute back to school card. I used two of the Background 3 shapes from Spring Holiday Cards welded together using Cricut Craft Room to make my shaped card base. The card base is 4.125 inches wide by 10.25 inches tall. I used the Background 2 shape cut at 3.403 inches wide, and 4.264 inches tall for the layer. 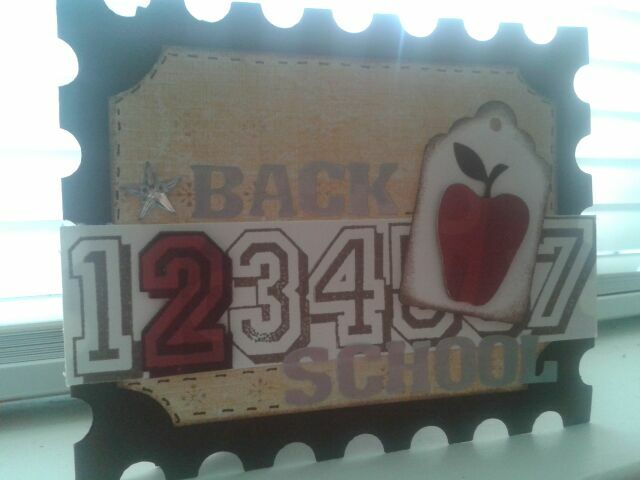 For the tag, I used Plantin Schoolbook and cut it at 2.139. I also cut two apple shapes from the same cartridge at 1.528. The reason I cut two, is because I wanted the stem to be a different color than the apple. I cut the stem off the red piece, and just adhered it to the brown piece so they would look more realistic. 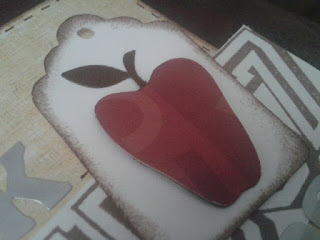 I then adhered the apple to the tag. I then used some number stamps to stamp a little border for the bottom of the card. 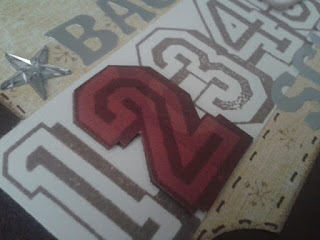 I stamped the number 2 on a piece of colored cardstock, to make it stand out. 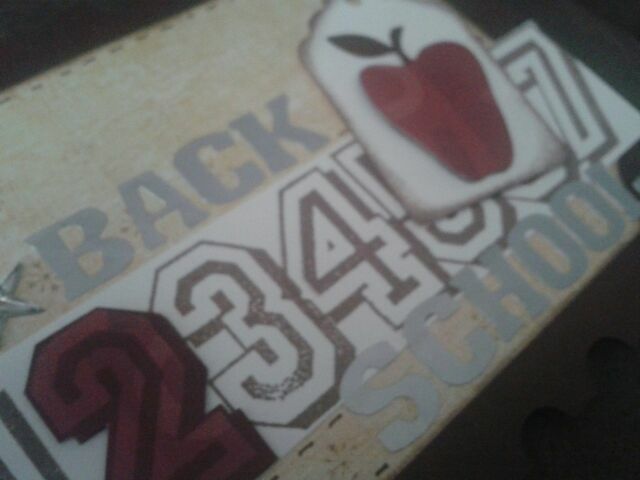 I then used letter stickers to spell out the rest of my "back 2 school" sentiment. My third and final project is a home decor item using Plantin Schoolbook. For the houses at the bottom, I used the "city" image cut at 2.264. I ended up needed two cuts piecing them together to form a continuous house line. I cut the grass three times at 0.0667 and layered them to look "full." 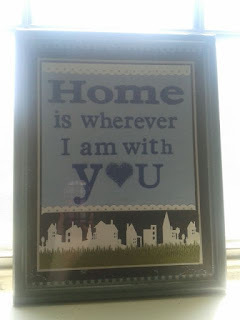 The word "Home" is using the Roly Poly feature cut at 1.236. The word "you" is using the Regular Plantin Schoolbook font, cut at 2.139. I also used a heart from the cart in place of the "o" in "you" and sized it accordingly. For all the other letters in the words, I used the same regular Plantin Schoolbook font and cut them at 0.736. Tip: I ran all the little letters through my Xyron sticker maker, to make it easier to adhere them. 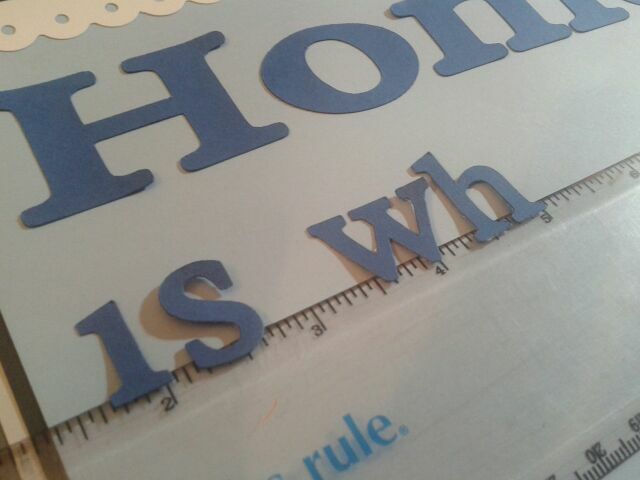 If you have trouble lining your letters up to make them straight like I do, then lightly stick them to a ruler to help you get them straight and spaced how you want them before you stick them down to your project. You can easily move them around on the ruler until you get them exactly as you want them. Those are my projects for you today, I hope you enjoyed! Please let me know if you have any questions, and as always make sure you're a follower to keep up with all my latest projects! Great job on that project!!! I love your projects. The home decor is super cute!!! your projects are amazing! you did an wonderful job. Your back to school card and birthday cards are my favorite. Very detailed. Melissa you are super talented. I really love your style. Great details on the chickie and balloons and love the Back 2 School card. Great shape cut. Adorable framed art, too. OH...MY...GOSH! i am in LOVE with your projects! The paper is FANTASTIC and so are your designs! I must say, I am TOTALLY making your home decor piece to display in my home!!! You ROCK!!! Amazing projects Mellisa. So much detail!! OM Goodness! I am a big fan of your work! I LOVED them all!! Cant wait to see what else is in store for future postings!! love the papers on your first card, the numbers with the large 2 on the second and the 3rd is super pretty. Love all three of your projects! You do beautiful work! Great projects and awesome tips! TFS!!! wonderful job on your projects, love color choices and inking. 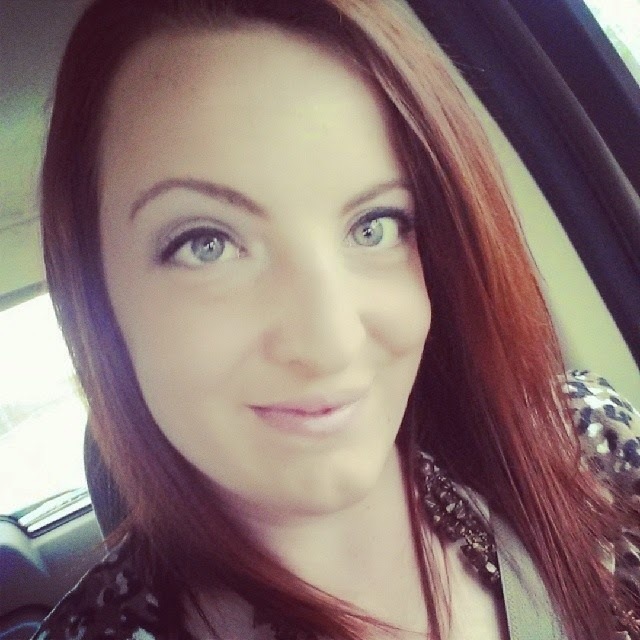 Wow, you knocked it out of the park with your peojects, Melissa! !I love everything but esp. love your home decor project! 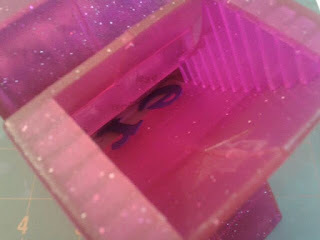 Melissa....I am loving your projects! Woo hoo! I love every thing you did! The home decor is my favorite! You made this momma bird so proud! Lovely projects! Love to use my Xyron X as well to stick down my itty bitty pieces! I am addicted to anything and everything craft related. I have been crafting in some form or another for as long as I can remember. Currently, I am into making cards, scrapbook layouts, mini albums, banners, wreaths, and other various home decor projects. "Copyright 2014 by Melissa Lipcsey/Paper Shenaniganz]" All original content on papershenaniganz.blogspot.com is copyrighted to Melissa Lipcsey. My original artwork is shown for your personal enjoyment and inspiration. My original artwork may not be used for publication, submission, or sale without my written consent prior to doing so. You may use my work for personal use, but do not claim it as your own. Give credit where credit is due.